Got a minute?! Watch our short YouTube Clips – take our survey and get eye-opening insights how to communicate climate change creatively. 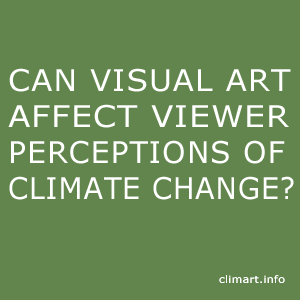 Welcome to our research project CAN VISUAL ART AFFECT VIEWER PERCEPTIONS OF CLIMATE CHANGE? where you can watch 4 videoclips and evaluate it according to YOUR opinion. The ’scientific ‚interest in the Art of Climate Change Communication has grown. Environmental psychologists, environmental social activists, entrepreneurs and campaigners have been united in the quest for systematic evidence with which to encourage sustainable behavior. The Kolleg fuer Management und Gestaltung nachhaltiger Entwicklung (KMGNE) is part of the international multidisciplinary research project CLIMart. Ask yourself: what make you giggle, inspire you, or fill your talks with friends? What are the ´channels´ to reach your attention? Right now we are activity recruiting participants for one part of this research project underway. By watching the 4 videoclips and by filling out the following 4 online surveys, you support our effort to make climate communication more fun and accessible for everyone. Please find videoclip links and survey links below. The videoclips are between 1-3 minutes long. We have made it very easy to fill out our survey, so it shouldn´t take more than 10minutes (4x) for each videoclip. Let me assure you that all data are collected anonymously, whatever information you tell us will not be disclosed to anyone and will only be used for research purposes. Do not hesitate to get in contract with me if you require any further support. The KMGNE Team is appreciating your support. Stay tuned and subscribe to our You Tube Channel. Dieser Beitrag wurde unter All, English abgelegt und mit ClimArt, video verschlagwortet. Setze ein Lesezeichen auf den Permalink.